David Gilpin was born on 6 April 1863 at Carlisle, Cumberland, England. He married Mary Ann (born at Wollongong 1857), daughter of James and Mary Southam, at Tilba Tilba on 21 October 1884 and they had five sons and two daughters. Mary Ann died at her residence on Parkes Street at Wentworth Falls on 5 November 1938, aged 80. David Gilpin died on 21 May 1952, aged 89, and was buried at Wentworth Falls Church of England Cemetery, NSW. David Gilpin arrived in Brisbane with his parents in 1866 and moved to Sydney the following year. He began his working life as a public school teacher before taking up land on the NSW South Coast. Later he became a suburban produce merchant in Sydney. He fought corruption and opposed boxing matches in the city but objected to being called a wowser. His wife was a life governor of Crown Street Hospital. He and his family lived at Railway Parade, Burwood. His main interests were photography and Biblical interpretation. In 1906 Gilpin was secretary of Camperdown Ratepayers Association. David Gilpin was an alderman and mayor for Camperdown Council in 1908-09. As Camperdown Mayor, he presided over the final meeting of the council on 7 December 1908. He negotiated an acceptable agreement to amalgamate with Sydney City Council. Gilpin was an alderman for Camperdown Ward of the City of Sydney Council from 8 January 1909 to 30 November 1924. He was a member of the Finance Committee in 1909 and 1911-19, the Electric Lighting Committee, 1909 and 1911-22, and its Vice-Chairman 1917-22. He sat on the Works Committee in 1910, the Queen Victoria Building Special Committee in 1911, and the Health and By-Laws Committee, 1915 and 1920-22. Gilpin was the Council member on the Board of Water Supply and Sewerage, 1922-25. 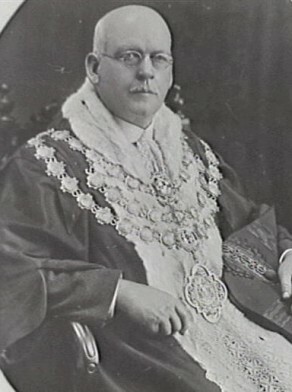 He was Lord Mayor in 1923 and again in 1924. As a member of the Civic Reform Association, he led a breakaway group which split the party in 1924. City of Sydney Archives: Aldermen’s Files; Photos: CRS 54/136; 54/227; 54/265; 44/133; and 80/266.